When it comes to freedom of expression there is a need for South Africans to protect our gains and broaden the right to even more people. In order to move forward, we have to take on the challenges of the present and learn the lessons from our past. As part of our human rights focus for March, we look at the case of the Grassroots community newspaper which came into being at a time when apartheid was at its most vicious. The offices of a community newspaper were burned to the ground in October 1985. It was situated opposite the Grand Parade and next to Cape Town’s historic City Hall. A few weeks earlier three of the newspaper’s employees were taken into detention by apartheid security police who swooped on their homes in the dead of night, armed to the teeth. Several other staff members went into hiding, moving around in disguise, some shedding their beards and moustaches, others donning scarves and wearing Gandhi-like spectacles. In the time ahead, the paper was banned in terms of emergency regulations. Police conducted several raids on the premises of Grassroots’ printer Esquire Press, and in the late 80s one of the staff members was shot and left for dead near a cemetery in Gugulethu. Fortunately – and almost miraculously – she survived the attempt to end her life. In many parts of the City and indeed, throughout the land, protests, teargas and funerals were as much part of daily life as having a haircut or taking the kids to school. The rebellion against that monstrous crime against humanity – apartheid, was growing with each passing day. The apartheid state unleashed unspeakable violence on the black oppressed and white democrats – arresting, hurting, maiming and killing those who dared to take a stand, and even those who did not. Just over 25 years on, these recollections of the Grassroots Community Newspaper experience, seem strangely surreal, even to those who were there when it all happened. 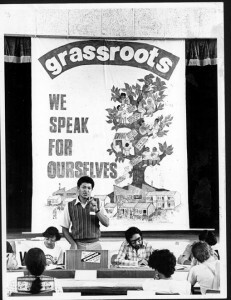 The idea of Grassroots, which operated from 1980 to 1990, was conceptualised in the late 70s by progressive journalists in the Writers Association of South Africa. It was further brainstormed with activists in the Cape, most coming from the fold of the Congress Movement – the ANC and its allies. The mission was to add a newspaper to the armoury of the resistance movement in South Africa with the overall aim of bringing apartheid to an end and replacing it with a democratic government and society. For obvious security reasons these aims were not documented – or publicly stated – but were well understood by those who drove this mission and the thousands who participated in its operation. 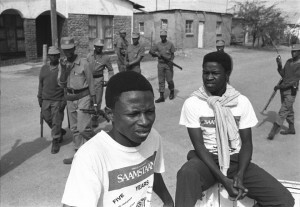 The activists drew inspiration from Durban dock workers strike of 1973, Mozambique gaining independence from Portuguese colonial rule in 1975 and the nationwide 1976 uprising which began in Naledi, Soweto. Activists argued that strong, enduring community organisations, built from the ground up, would make it almost impossible for the Apartheid State to crush resistance in the way that they did in the 60s and – to a lesser extent – after the 1976 rebellion. Grassroots established itself in an office off Greenmarket Square with the veteran activist Johnny Issel heading up a small staff component. The paper was to be tabloid size, with some 12 to 16 pages and would appear monthly. The real driving force behind this project was hundreds of community activists who had been drawn into the unfolding struggle in the late 70s and early 80s. They participated in newsgathering meetings, distributed the paper door-to-door across the Cape Flats, helped produce content for the paper and represented their organisations and communities at Grassroots forums that including quarterly General Meetings and AGMs. Many of these activists were referred to as charterists, those whose political programme was encapsulated in the Freedom Charter which was adopted in Kliptown in 1955. A small number of journalists in the mainstream papers, mainly black, contributed to the Grassroots effort. Eager to support the struggle against apartheid and angry at the racism practised in newsrooms themselves – both Afrikaner nationalist and English liberal – they assisted with skills development and writing and editing. The Journalists and the growing anti-apartheid activist fraternity all shared the view that the mainstream media – apart from its job reservation practices – almost exclusively gave voice to an enfranchised minority. This was then part of the motivation for the development of alternative media platforms. Issel was banned and Leila Patel took over as co-ordinator for two years until student leader Saleem Badat stepped into the hot seat between 1983 and 1986. By the mid-80s Grassroots consisted of the newspaper, a student publication Learning Roots, a political magazine, New Era and a media education project. A rural project was established with Saamstaan newspaper in Oudtshoorn as the flagship and a range of skills training initiatives across the province. There were passionate debates during this time about the content of Grassroots, advertising policy, democratic practices in a newspaper project and importantly, how to deal with state repression. The notion of Grassroots as a “collective organiser” featured strongly in the philosophical outlook of key players in the project. The paper had to do more than just inform and entertain – it had a critical role to play in bringing activists together around common goals, inspiring the formation and growth of local organisations and educating communities about their rights. This vision took Grassroots into rural towns and villages and eventually culminated in the launch of Saamstaan in 1984. That is a story on its own which was told in a 24 minute SABC documentary three years ago. At its height Grassroots attracted 40 to 50 representatives from civic organisations, trade unions, student bodies and religious groups to its weekly news gathering meetings and hundreds from right across the Cape would gather for the Annual General Meeting. Activists would gather in large numbers in selected communities and, armed with copies of Grassroots, would encourage residents to be active in their local civics, bolster the trade union movement and make a contribution to student campaigns. Far from being a conventional newspaper, Grassroots developed into something of a movement, bringing together people from across the social and geographic spectrum under one umbrella. It certainly prepared the ground for the formation of the United Democratic Front in 1983, since the UDF united a broad cross-section of organisational formations, but on a much bigger scale. The paper’s content focused largely on local issues – electricity and maintenance campaigns, rates and rental tariffs. It was not the content of the paper that was a threat to state security, but rather what the project represented in its entirety. It had become a powerful mobilising tool and was helping to build people’s power from grassroots level. In the second half of the eighties, though, the paper did begin taking on more of a political character, as the struggle against apartheid intensified. The paper was largely funded by a Church group in Holland, committed to the fight against apartheid. Grassroots was sold for nominal amounts and so income from sales was insignificant. The advertising revenue was limited since only a handful of small businesses on the Cape Flats advertised in the paper. Big businesses, which largely sided with and benefited from apartheid, were certainly not going to pour its resources into an anti-apartheid community paper. Though the paper was relatively small, its impact was massive. Countless activists have spoken of Grassroots’ inspirational effect on their morale, since they viewed the project as quite an act of defiance against a seemingly monolithic and powerful State. Significantly, a large number of activists acquired media skills through their involvement in Grassroots and Saamstaan and they today occupy important positions in both mainstream and civil society communication sectors. Grassroots closed its doors in 1990, the same year that negotiations to establish a democratic South Africa began. For a few years before that, participation had already begun to wane, partly due to repression, but also as result of activists devoting most of their energy to the work of the United Democratic Front. Debates still occur over the decision to close Grassroots. It is argued that alternative community media platforms are of critical importance, to advance Constitutional ideals and rights and protect our democratic gains as well as to counter the lack of balance and diversity in the mainstream press. These debates will rage intermittently for many years to come and may lead to new realisations and initiatives in time to come. Whatever the case, one thing is certain: Grassroots inspired and empowered a legion of activists and community members at a particularly turbulent time in our country. Its place in our media and political history is assured. This story first appeared on The Journalist.